The Detroit Pistons have an interesting identity. Despite having some fantastic offensive players through the years, this is a franchise in which individual achievement has had little correlation with team success. Not one of the Pistons’ nine all-time scorers (by scoring average, minimum 100 games) possesses a ring from one of the franchise’s three championship seasons (1989, 1990 & 2004). In their title runs, the Pistons have been defined by toughness, rebounding and defensive intensity. The franchise was led in the late 80s by Isiah Thomas and Bill Laimbeer, perhaps the most hated player in league history, and later by defensive stopper and workhorse Ben Wallace. The Pistons’ biggest offensive threats- Dave Bing, Bob Lanier, Baily Howell, Grant Hill, among others- never had the kind of team success that their defensive-minded counterparts enjoyed, while the likes of Rick Mahorn, John Salley, Dennis Rodman and Ben Wallace- hard workers but hardly super-skilled- have achieved the ultimate team success and a remembered as champions. While the past two seasons (and probably a few to come) have been less-than-stellar, thanks to the epic failure that was the Darko Milicic era, choosing of Rip Hamilton and Rodney Stucky over Chauncey Billups and some lackluster free agent signings (what would Isiah, Laimbeer and Mahorn have thought of Charlie V?? ), the Pistons have put together a pretty solid legacy. The greatest moments in Pistons history have been defined by championship performances by tough, inspirational lead guards. For much of the past decade, a Chauncey Billups-led squad appeared in an amazing six consecutive Conference Finals, making consecutive trips to the NBA Finals and destroying the heavily favored Lakers to capture the 2004 title. As important as he was to the franchise, Billups’ numbers during his time with the Pistons- 17 ppg, 6.4 apg in 463 games- fall short of what one might expect based on his lofty reputation. While Billups became a championship-caliber player and “Mr. 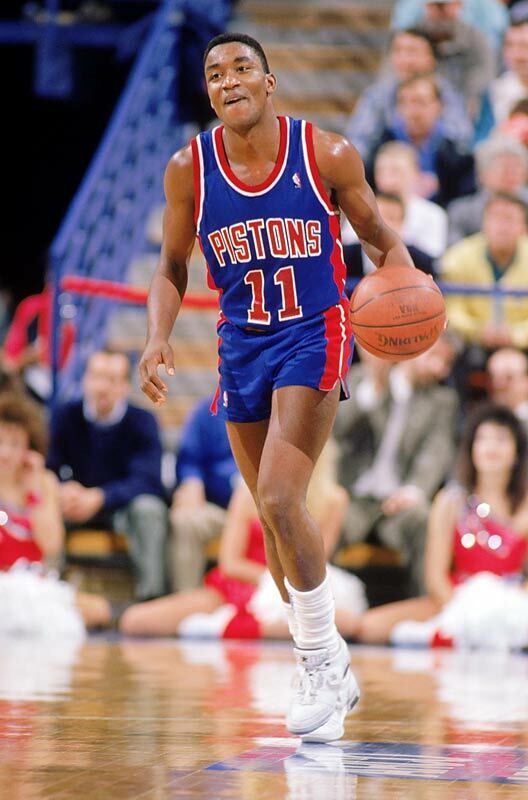 Big Shot” in leading the Pistons to their third title, Isiah Thomas, the man who willed the franchise to the first two, will be the face of the franchise for years to come. One stats alone, he’s deserving of this spot, but Isiah’s legendary toughness (Game 6, 1988 Finals; I’m a Laker fan and it still gives me chills) defined the “Bad Boy” Pistons. On those teams, Rick Mahorn used thug tactics to compensate for a total lack of talent, while Joe Dumars excelled because of his smooth skills, and not violence. Isiah did both. As skilled a ballhander and playmaker as there’s ever been, Isiah Thomas was just as comfortable putting a forearm upside someone’s skull as he was in finessing his way to the hole. He was the embodiment of both the talent and the toughness of the teams he led. To the generation(s?) of NBA fans too young to remember Isiah Thomas as anything other than a comically bad GM: watch footage of his playing days. Isiah is perhaps the best pure PG ever. As bad as he’s been as a GM, he was that good running the point. 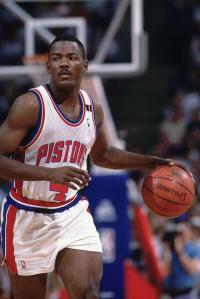 What hasn’t Joe Dumars done with the Pistons? Franchise leader in games played, second in points scored, six trips to the All-Star Game, four-time All-Defensive 1st Team selection, two championship rings, MVP of the 1989 Finals, 2006 Hall of Fame inductee and the lone likeable member of the Bad Boys. And if all of that wasn’t enough, a decade and a half later he built the franchise’s third championship team as GM. Despite superior stats and his status as the franchise’s original backcourt star, Dave Bing comes in a hard-luck second. 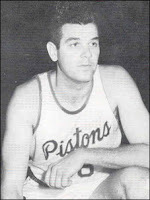 Bing, the 1967 Rookie of the Year and now the mayor of Detroit, was a fantastic offensive player in his decade with the Pistons, averaging 22.6 ppg and 6.4 apg in 675 games. Bing also played a major role on the Pistons’ first post-Fort Wayne winning teams (1970-71 & 1973-74). While he put up stats similar to those of Joe Dumars and won a ring of his own in 2004, Rip Hamilton (18.8 ppg, 3.9 apg in 576 games) finishes a not-so-close third. One of the great injury “what ifs” in NBA history. Remember what a force this guy was? 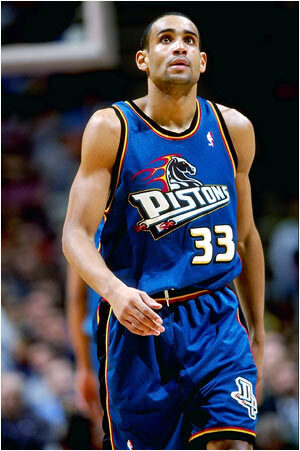 During six actually healthy seasons in Detroit, Hill was a top-flight scorer and a constant triple-double threat. The #3 pick in the 1994 draft, Hill took the league by storm. In 1994-95, he averaged 20- 6- 5, was the first ever to be voted an All-Star game starter (led all players in votes received) and shared Rookie of the Year honors with Jason Kidd. In his six years with the Pistons, Hill made the All-Star team five times (there was no All-Star Game in 1999), was named to the All-NBA 1st Team in 1996-97 (averaged 21- 9- 7 with 13 triple-doubles), and made the 2nd Team on four occasions. At his peak, Hill was as popular as any player in the NBA, even edging out His Airness in Michael Jordan's first All-Star game after his first retirement. As a member of the Pistons, Hill joined Wilt Chamberlain as the only players in NBA history to lead their teams in scoring, rebounding and assists three times (Elgin Baylor’s also done it twice). Had his career not been ravaged by ankle injuries- the first of which occurred in one of his last games with Detroit- Grant Hill would have become one of the greatest-ever all-around players. Hill shares this spot with the offensive-minded, defensively-challenged Kelly Tripucka (21.6 ppg 4.5 rpg in 352 games) and Adrian Dantley (20.6 ppg in 192 games), who played SF for the Pistons in the years immediately preceding the 1989 and 1990 titles- probably not a huge coincidence. Also deserving a shout out here is Tayshaun Prince, the only member of this group with a ring, and, thanks to his length and defensive versatility, a big part of the Pistons’ run in the early-2000s. The Pistons’ first post-Fort Wayne star and a consistent frontline performer in the 1960s. 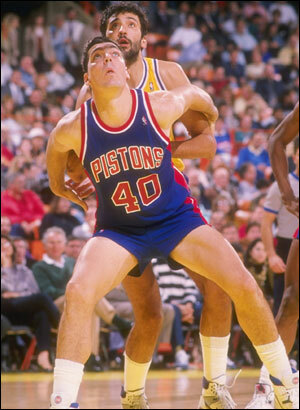 Bailey Howell still holds the franchise record for scoring average by a PF and ranks second in Pistons’ history in rpg, trailing Ben Wallace’s 12.9 rpg. In five individually excellent seasons (the team was pretty bad) in Detroit, Howell was selected to four All-Star teams, and never averaged less than 17.8 ppg or 10.5 rpg. Howell certainly had competition here, but his stats outclassed those of hometown hero Dave DeBusschere, who put up 16.1 ppg and 11.2 rpg in 440 games for some equally awful Piston teams. A relatively close third place goes to a young Dennis Rodman, who played a key role in Detroit’s first two titles, averaging 8.8 ppg and 11.5 rpg in 549 games. While the jewelry helps, Rodman was never one of the four best players on the Pistons and his stats simply do not stack up against the competition here. Some MAJOR “face of the franchise points awarded here. If Isiah Thomas personified the Bad Boys’ combination of talent and toughness, Laimbeer represented the dark side of those squads- a fair bit of talent, a lot of toughness (missed just nine games in 14 seasons) and a whole lot of hoolliganism! While the talents of Isiah and Dumars helped the Bad Boys nail down back-to-back titles, Laimbeer and his band of thugs made sure opponents were never comfortable, roughing up Magic, Bird, McHale, and most notably Michael Jordan. In fair to extremely hateable Laimbeer, he was more than just a cheap shot artist. This guy could really play. Not only did Laimbeer average a double-double over the course of roughly a dozen years in Detroit, during his five statistical peak (1982-83- 1986-87) he averaged 16 ppg and 12.3 rpg and did not miss a single game. Fittingly, in keeping with the Pistons’ apparent disdain for combining team success with great stats, it was when Laimbeer’s number began to wane that he collected a pair of rings. Meanwhile, Bob Lanier (22.7 ppg, 11.8 rpg, 3.3 apg in 681 games), a highly underrated big man whose lack of team success led to his prime years in the early 1970s being overshadowed by Willis Reed an aging Wilt and a young Kareem Abdul-Jabbar (more on him tomorrow). Also deserving of honorable mentions here are Ben Wallace, the defensive catalyst for the 2004 champs, and Larry Foust, a six-time All-Star who averaged 15- 10.9 in 487 games with the Fort Wayne Pistons.